It was hard to believe when I first learned there was such a thing as white Carnival. Even today I find that to be true with many new collectors. The truth of the matter is that white Carnival was made in large quantities. It is certainly the most plentiful of the pastels. While I haven’t researched it in detail, it wouldn’t surprise me to find there is more white Carnival than either green or cobalt blue. That is definitely the case, for example, with water sets. A quick count indicates some 26 different patterns in white Carnival compared with 14 in green and 12 in cobalt blue. 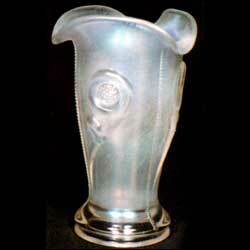 Newer students of Carnival Glass often confuse clear Carnival with white Carnival. Of course, both are on clear base glass that has been given an iridescent spray to make it Carnival Glass. The white, however, is frosty and the clear is not. The difference is the type of iridescent spray that was used. Clear Carnival is not as attractive as frosty white and not much of it was made. The Shriner’s Champagnes are, perhaps, the best examples. The degree of frostiness on white Carnival will vary greatly. Northwood’s Grape and Cable, for example, is usually quite frosty. Some of Fenton’s white, however, is not all that frosty. The Orange Tree Orchard water pitcher is a good example. 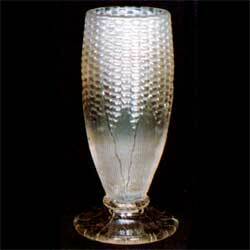 These pitchers tend to be frosty only around the top and become quite clear and “glassy” toward the bottom. I think most collectors will agree that the frostier the better. There seems little doubt that Northwood must be called the “king” of white Carnival and this applies to both quantity and quality. Fenton runs a close second with Dugan not far behind. 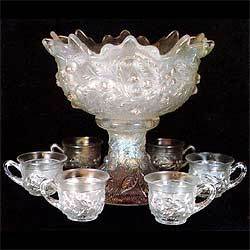 U. S. Glass also produced a substantial amount of quality white Carnival. 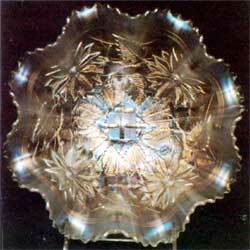 Imperial must not be forgotten, but their contribution was small–NuArt plates, Floral and Optic pieces, etc. I can think of no white Cambridge, Westmoreland, or Millersburg. To me, white Carnival has always been one of the exotic, prestigious, and somewhat snobbish colors. Some will argue that it is hard to display and I agree. When shown on white or light colored walls, it does ten to “get lost.” However, when displayed on a somewhat darker background and with proper lighting, it can be the most exciting and rewarding of the Carnival colors. The results are well worth the effort. 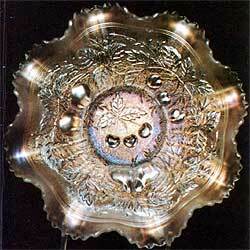 Left–PEACOCK AT THE FOUNTAIN PUNCH SET (Northwood)–$2,500. Not as rare as the other pastels in this pattern–aqua opal, ice green, or ice blue–but still a tough one to find. One sold for $2,250 at the Heart of America convention auction in 1984. Right–PEACOCK AND URN 9″ PLATE (Fenton)–$300. Scarce, but can still be found. Carries the Bearded Berry pattern on the exterior. Too bad this hasn’t turned up in aqua opal, ice blue, or ice green. Left–PANTHER MASTER BERRY BOWL (Fenton)–$1,000. Very rare. Three or four confirmed. Found in no other pastel colors to my knowledge. One with a bit of damage sold at the Wallick auction in 1983 for $625. 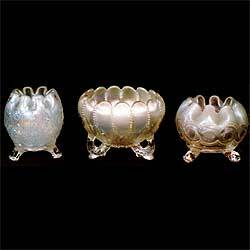 Right–COSMOS AND CANE 10 1/2″ RUFFLED BOWL (U. S. Glass)–$200. A scarce piece. Less frosty than some white, but the iridescence is superb. The fact the interior is plain with the pattern on the exterior hurts desirability. Right–PERSIAN GARDEN SANDWICH TRAY (Dugan)–$2,000. Rare and beautiful in any of the three colors in which it has been found–white, amethyst, and peach opal. One of the three known in peach opal sold at the Courtney auction in 1985 for $4,750. 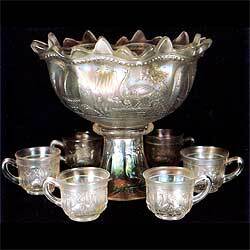 Right–ACORN BURRS PUNCH SET (Northwood)–$2,750. Some of the popularity of the punch set in this pattern is the fact it was made in 8 different colors–white, purple, marigold, amethyst, green, ice blue, ice green, and one set in aqua opal. Blue cups have also turned up, but no bowl or base. The frosty white set in this pattern is outstanding. It will not sell for quite as much, but in my opinion, it is just as rare as the ice blue or ice green. Left–COSMOS AND CANE WATER PITCHER AND TUMBLER (U. S. Glass)–$1,200 and $200. This is a rare water pitcher. Only some 6 or 8 are known in white. I have always felt this pitcher should bring more than it does. One sold for $800 at the Miller-Mogg auction in 1983 and $1,200 at the Mello auction in September 1984. It was made only in white and honey amber. PHOTO NO. 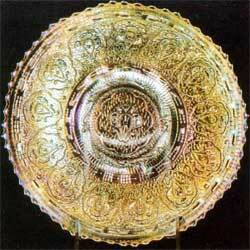 8–PERSIAN MEDALLION 9″ PLATE (Fenton)–$750. I can confirm only three of these. This one has a touch of gold in the iridescence which makes it one of the outstanding pieces of white in our collection. I believe this is the only pattern in which there are three sizes of plates. In addition to this 9″ size, there is also a 6″ size and the 10 1/2″ chop plate. Only the 9″ plate was made in white or in any other pastel color as far as I know. 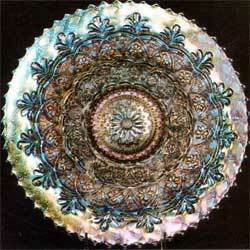 Many of us would kill for a chop plate in aqua opal. PHOTO NO. 9–CORN VASE (Northwood)–$250. These very seldom have good iridescence. This one is no exception. Harry Northwood must have been in a pastel mood when he made Corn Vases. White and ice green are no doubt the easiest to find of the wide range of colors in which this piece was made. The other pastels, however–ice blue and aqua opal–are a different story. Right–ROSE BOWLS (Northwood)–The Finecut and Roses ($350) is the most available of the three white Northwood rose bowls shown here. The Leaf and Beads ($650) and the Beaded Cable ($600) are seldom offered for sale. They go into rose bowl collections and are hard to shake loose. All pastel rosebowls are tough to come by and most of them are down right rare. No doubt, the Grape Delight and Persian Medallion in white are the most available. 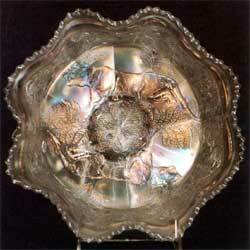 Left–POINSETTIA FOOTED 8 1/2″ RUFFLED BOWL (Northwood)–$950. To my knowledge this is one of a kind and putting a value on it is a pure guess. 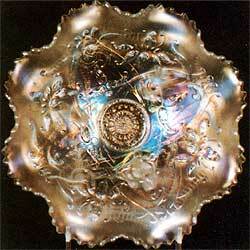 A single rare aqua opal bowl is also known. This popular pattern was made only in this bowl shape. 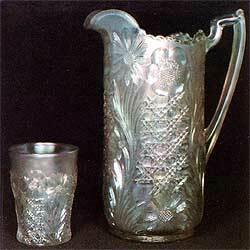 The milk pitcher that goes by the same name is quite a different pattern and was made by Imperial. This bowl in ice blue is also very scarce. I am unable to confirm this piece in ice green. 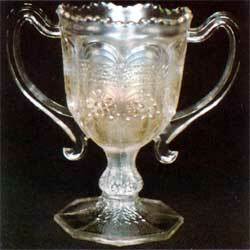 Right–ORANGE THREE LOVING CUP (Fenton)–$450. A hard one to find in white, but if you want a really tough assignment, try to find it in aqua opal or peach opal. Only one in each color is known. They reside side by side, in the Whitley collection in Texas. Floyd will make Cecil go back to work before he releases either of those loving cups. 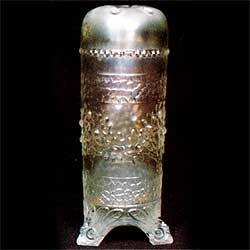 Left–TORNADO VASE (Northwood)–$950. Only this one has turned up in white. Three are known in ice blue, but none are confirmed in aqua opal or ice green. The standard colors (marigold, green, and purple) were made in two sizes. This white one and the three in ice blue are the small size. The white one is on a plain surface, but the ice blue ones are ribbed. A few of these vases are known in cobalt blue and there is one whimsey shape in sapphire blue. Right–THREE FRUITS 9″ COLLAR BASE STIPPLED BOWL (Northwood)–$750. Only 3 or 4 of these are known in white and about the same number in ice green and ice blue. There are a few more in aqua opal. There is also a spatula footed version of this pattern in white, ice green, ice blue, and aqua opal. It carries the Meander pattern on the exterior. There is still a third version of this pattern in white that is on a dome base. It has Basketweave as an exterior pattern with Northwood’s Vintage pattern superimposed on the Basketweave. In addition to white, I have seen this in ice green, marigold, green, and amethyst, but in no other pastel colors to my knowledge. 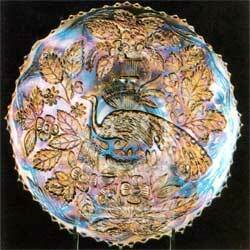 Left–ORANGE TREE HATPIN HOLDER (Fenton) -$1,000. Though it wouldn’t win any beauty contests for white Carnival, this piece is extremely rare. For sometime it was thought that this was one of a kind. It is now understood that another one or two have turned up, but I have not seen them. Like some of Fenton’s other white, this piece is not as frosty as one might choose. The iridescence, however, is quite good. Right–WISHBONE 8 1/2″ FOOTED BOWL (Northwood)–$550. While made in a wide range of colors, only the pastels and the cobalt blue are rare. The white pieces are a bit easier to find than ice blue or ice green. Only three bowls are known in aqua opal. 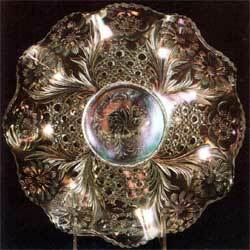 These pieces, to my knowledge, all carry the Ruffles and Rings as the exterior pattern. Don’t forget the second version of this pattern which is a 10″ collar base bowl and plate. This larger bowl is also found in white, but in none of the other pastel colors. The white bowl I have, uses Basketweave on the exterior. Well, that’s a quick look at white Carnival. Of necessity, any article on a specific color can do little more than scratch the surface. There are, however, some rare white pieces not previously mentioned, that must be listed. These would be the three sizes of the Grape and Cable punch set, Wisteria water pitcher, Beaded Shell mug, Orange Tree mug, Dandelion water set, Ten Mums water set, Raspberry water set, Heavy Iris water set, Many Fruits punch set, Blackberry Block water set, Good Luck plate, Little Fishes master berry bowl, Singing Birds mug, Oriental Poppy water set, Memphis punch set, and Footed Orange Tree table set. In conclusion, I would suggest you not wait too long before adding a few white pieces to your collection as some of us did with the other pastels. White is destined to become another of the “vanishing” colors in the not too distant future.